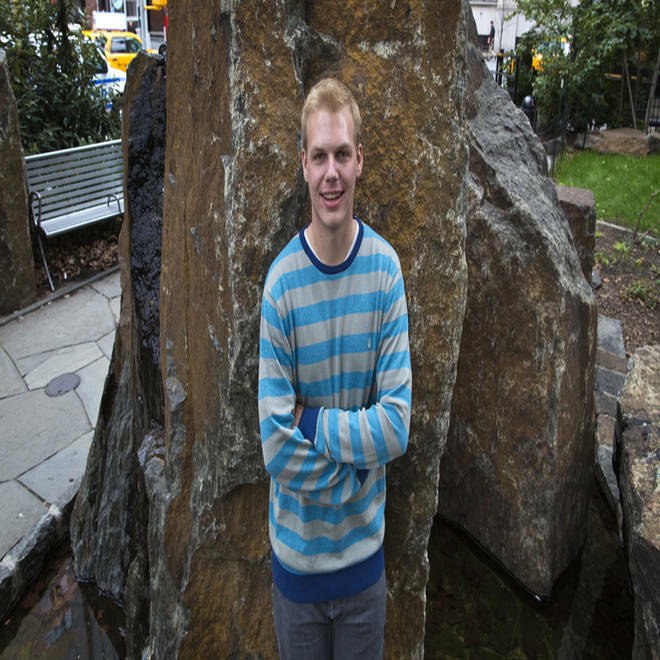 Ryan Andresen, 18, of Moraga, Calif., in New York on Oct. 12. After completing the requirements for the Boy Scouts' top honor, the Eagle rank, he was denied the award because he is gay. The organization has a longstanding, controversial policy banning gay Scouts and leaders. 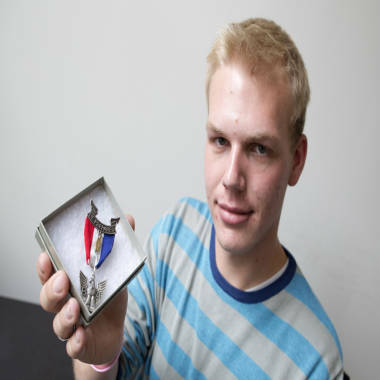 NEW YORK -- On his 18th birthday, Ryan Andresen received a symbol of the Boy Scouts’ highest honor, which the national organization had denied him because he is gay: an Eagle Scout pin. He got it on Monday from another Eagle Scout, Matthew Kimball, 30, who was also in his troop years ago and publicly came out as gay after learning about his fellow Scout’s plight. Andresen learned more than a week ago from his father, Eric, that the Scoutmaster of Troop 212 would not be signing off on his Eagle application even though he’d completed the requirements. The father said the Scoutmaster told him he was grappling with the conflict between Ryan’s sexual orientation and the policy set by the national organization that bans Gay Scouts and leaders. The Scoutmaster has not responded to emails or a phone call seeking comment. Andresen said he had found his father crying over the rejection, which he then explained to him. Andresen came out in July to his fellow Scouts in a letter that was focused on bullying in the troop. But he said his Scoutmaster knew before then that he was gay and had encouraged him to stick with the troop when he had thought about not pursuing his Eagle Scout rank. Andresen shows an Eagle pin given to him by Matthew Kimball, a fellow member of his Troop 212. Kimball, 30, publicly came out as gay after learning that Andresen was denied his Eagle award because he is gay. Kimball has asked other Scouts to send in their pins for the teen. His final Eagle Scout project focused on bullying. Named the “tolerance wall,” it consists of 288 tiles depicting acts of kindness and is displayed at his middle school, where he says he endured name calling over his sexual orientation. He said he also was bullied in the Boy Scouts because he was gay. Speaking about the bullying brought his mom, Karen, to tears. The Boy Scouts of America have a longstanding policy denying membership to gay leaders and Scouts, which they reaffirmed earlier this year after a two-year confidential review of the controversial ban. “While a majority of our membership agrees with our policy, we fully understand no single policy will accommodate the many diverse views among our membership or society,” BSA spokesman, Deron Smith, said in an email in August. But the family has disputed that, saying the only reason Andresen was denied the rank is "because the Boy Scouts of America has a problem with Ryan being gay." Andresen has had his emotional ups and downs since he learned he wouldn’t get his Eagle, though is family is still appealing that decision and Karen Andresen started an online petition calling for him to get the award. He is also hurt that his Scoutmaster has not responded to a letter he wrote him. Andresen said he has received some critical messages online that he was bullying the Scoutmaster. To earn the Eagle rank, which is in its 100th year, Scouts must progress through five lower ranks, earn 21 merit badges and serve six months in a leadership position, among completing other tasks. More than two million young men have received the Eagle rank. Kimball, who started a campaign to collect Eagle regalia for Andresen, said he has gotten up to 170 pledges of pins. Scouts for Equality said last week that some 300 Eagle Scouts had returned their regalia to the Boy Scouts in protest since mid-July. Brian Groenig, 36, of Lake Stevens, Wash., said he backs the BSA’s decision. A spokesman for the Boy Scouts of America, Deron Smith, said 50,000 Scouts earn the Eagle rank every year. He said in August that a “few” had returned their medals, badges or certificates since the membership policy announcement. On Tuesday, he said he didn’t have an update on numbers of regalia returned, but noted such items were either kept at the national office or stored in the National Scouting Museum. Andresen said he is looking forward to returning to high school and being out of the spotlight, though he knows this experience has changed the course of his life. He initially thought he would go into the family business after college, but now has some new ideas.